This bread is something my mom’s Serbian family made for holidays. Even my mom, pretty much a non-cook, felt duty bound to make it at Christmas time. Strangely, there doesn’t seem to be much information on the Internet about the origins of this bread. I have no idea if it’s still made today in The Balkans. My aunt’s typed recipe says, “the Slavic Catholics call it Potica.” My family was Christian Orthodox. I knew a Catholic Slovenian whose family made a similar bread that they called Potica. If you do a Google search you will see references to Potica. However, Orevnitza seems to be completely unknown outside my own family. All references to Orevnitza on The Internet that I can find originated with me, with the exception of this site. It’s the site for a self-identified Byzantine Catholic Church (Orthodox customs, Catholic beliefs) in Indianapolis that sells baked goods (including Orevnitza) I’ve never heard of anyone but my family eating or making a bread by this name with these ingredients. We like to eat this for breakfast, toasted and slathered in butter. In a large mixing bowl, combine 1 1/2 cups of the flour and the yeast. In a small saucepan over medium-low heat, warm the 1 1/4 cups milk, the 1/4 cup sugar, butter and salt, stirring occasionally, until just warm, but not boiling, and butter is melted. Add warm milk mixture to flour. Add 2 of the eggs. Using a handheld electric mixer, beat on low for 30 seconds. Turn mixer to high and beat for 3 minutes, scraping the sides of the bowl as you go. Using a wooden spoon, stir in as much of the remaining flour as you can. Turn dough out onto a lightly floured surface. Knead for 10 minutes, adding the remaining flour as you go until the dough is soft and not sticky. Shape dough in a ball and place in a lightly oiled bowl. Cover and let rise in a warm place until doubled. (My aunt doesn’t say how long. Inside my preheated and then cooled oven, it took about 2 1/2 or 3 hours) Punch dough down. On a floured work surface, divide dough into two equal parts. Roll one out into a rectangle about 12 in. x 18 in. and between 1/4 in. and 1/8 in. thick. Spread half the filling evenly over the dough, being careful not to tear the dough. It’s easiest to use your hands. 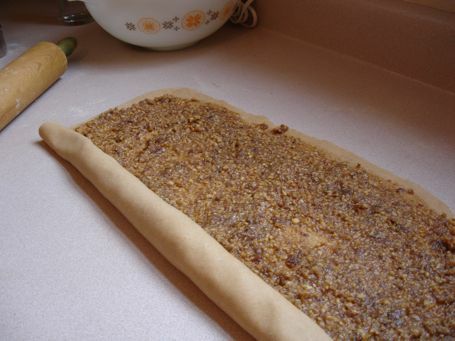 Leave about 1/2 inch around the edges of each piece of dough bare. Preheat oven to 325°F. Break the remaining egg into a small bowl and beat lightly with a fork. Brush the edges of the dough lightly with the beaten egg. To shape, beginning at one of the wide edges of the rectangle, roll up fairly tightly, jellyroll style. Press the edges gently to seal. The egg should act as “glue.” Pinch the ends shut. Gently bend the loaf into a snail shape and place on a parchment lined baking sheet. Roll out, fill, roll up, and shape the second piece of dough, in the same way, reserving the remaining egg for the top of the loaves. Cover both with a clean towel and let rest for 30 minutes. Brush the surface of each loaf with the remaining beaten egg and bake for 40 to 45 minutes or until golden brown all over. Cool on a rack before slicing. 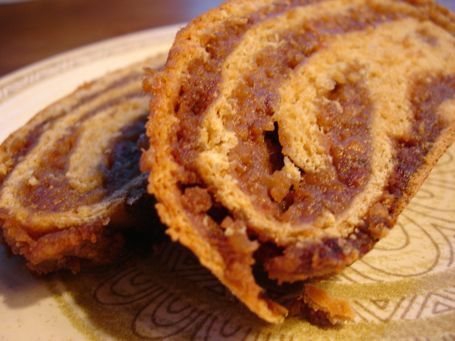 This entry was posted in breads and pizzas, breakfast, holidays and tagged date bread, Orevnitza, Potica, Serbian Christmas bread, walnuts, yeasted breads. Bookmark the permalink. Post a comment or leave a trackback: Trackback URL. 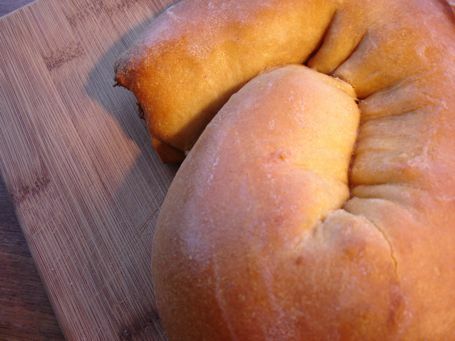 Yes, it is called Potica or Povitica which means to “wrap in” but we always just called it “nut roll”. It derives from a Serbian-Croatian tradition but every family tends to have slight variations of the recipe as it was handed down. Thanks for sharing! Yummy! Thanks for stopping by. Nobody I know has ever heard of orevnitza and I’ve only met one Croat who knows/makes Potica. Do you eat it at Easter too?